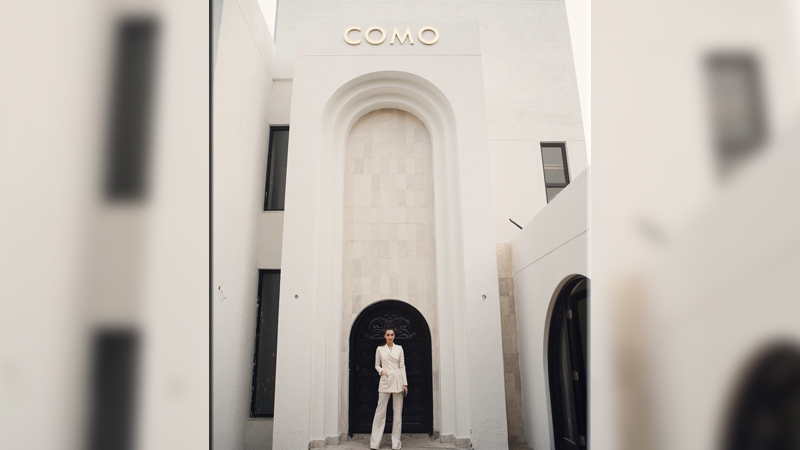 Pakistan’s first private museum dedicated to the preservation and promotion of contemporary and modern art Como opened its doors to the public this month. It is founded by Seher Tareen, a passionate art collector and entrepreneur, who holds a Master’s Degree from Central Saint Martins, London, with a special focus on art curation. It’s her first very carefully curated exhibition comprising some of the major players of the art world. This path breaking curator has set a unique tone to the aesthetic course of Pakistani art. The show attempts to reflect the new directions in art, to critically analyse the ever changing socio-political nature of modern times. It goes beyond the marginal and mainstream; a representation of cultural expression which attempts to transcend the present impasse through a diverse group of artists who are challenging norms with conversations through new boundary breaking art. This is discourse in the art culture of Pakistan. At present there is an absence of a standalone professional art gallery catering only to extensive contemporary artwork, a niche that Como has inhabited. 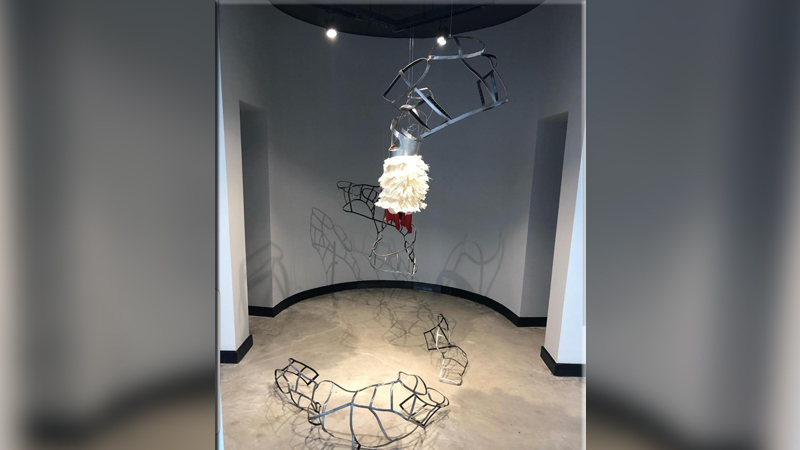 It is a non commercial space, with long-standing shows, representing evolutionary trends and unorthodox ways of portraying contemporary stigmas in art. Whereas, contemporary art exhibits portray the relationship between art and society, these works have an ability to transfer emotions and motivate not just in a social context, they enable a dialogue within this space between the artworks and the audience itself. Engaging with a work of art connects you to the current culture of your surroundings, to newer ways of perceiving the world, with a profound effect on knowledge and self understanding. It aims to teach diversion and difference of opinion, of individual thought, acceptance and tolerance for the society at large. The show is inspired by the paradoxical concept of ‘one’ – the beginning, the first, the only. A universal unit of singularity that can hold the concept of the divine, one is the paradox of the finite and the infinite. It is the start, the end and all that lies in between. Featuring the works of Rashid Rana, Risham Syed, Ali Kazim, Naiza Khan, Salman Toor and Saba Khan, Como has made a fascinating introduction to contemporary art for Pakistani audiences. 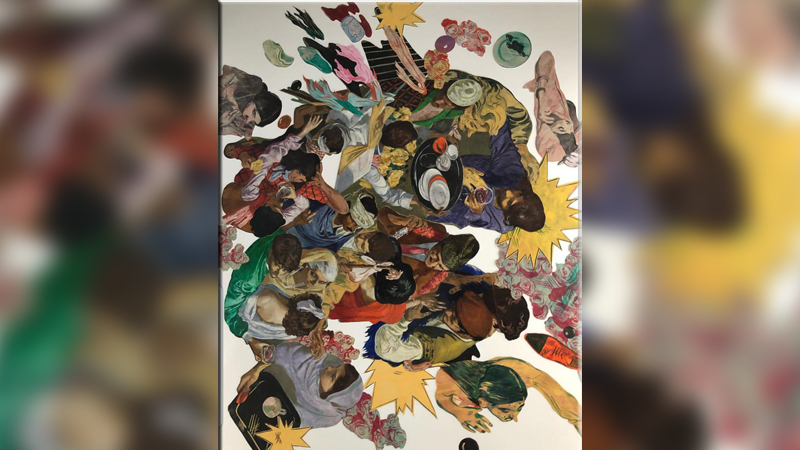 Widely considered one of the most prominent artists working in South Asia today, Rashid Rana is representative of an entirely new kind of art from Pakistan. The show will enable the local audience to see some of his seminal works including the two iconic works ‘I Love Miniatures’ and ‘Red Carpet 1’. These works, along with the others on display, have acquired international fame as the most iconic work to come from subcontinent in the contemporary era. Risham Syed’s powerful work is riddled with subtlety. ‘The Marble Hearth’ for example is an ornate, Victorian marble fireplace that represents the comfort of the traditional family unit and home. 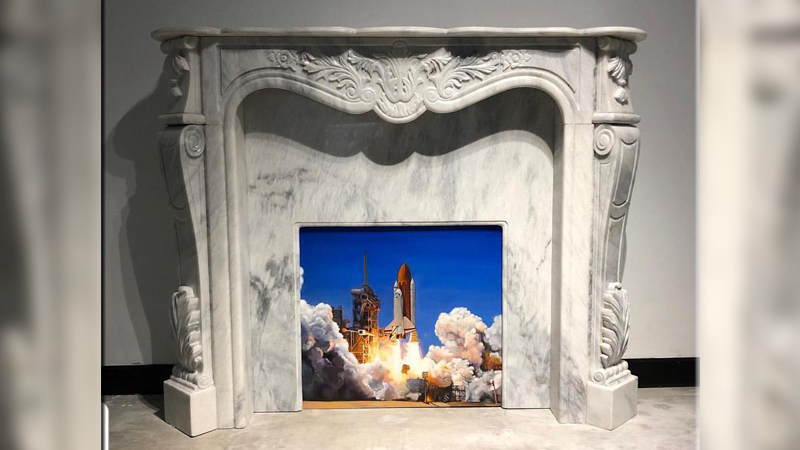 Through this, the viewer is invited to look at a painting of the Space Shuttle Discovery, taking off, which simultaneously represents the so-called advancement and destruction in modern times. Risham Syed sees humour and irony in this. This also points towards violence within domesticity that connects with violence of the outside world. This, along with her ‘Lahore Series’ which explores and questions the urban expansion of the city with Syed’s nostalgic lens. It is both poignant and a point of pride to showcase this body of work in the city it speaks of. Saba Khan is has produced an entire series for the show, titled, ‘Monuments and Other Failures.’ With this body of work, Khan continues her social commentary, this time targeting the bureaucratic structures and the structures constructed by it, literally. Works such as ‘The Inauguration Plaque,’ ‘Monument for an Undecided Event,’ and ‘The Bureaucrat’ poke delicious fun at the useless structures and activities of government in the most deliciously kitsch way. Saba uses paintings, LED light signs and sculptures to make her point – loud and clear! Salman Toor, one of the finest oil painters of his generation, has created a site specific permanent ceiling mural. Titled, ‘Upside Down Party’, it’s a collage of oil and acrylic and a thing of beauty. In his own words, “it is a fantasy of togetherness among unlikely characters, belonging to different social orbits”. Aerial perspective of the figures recalls a mirror image as though the gallering was happening in the atrium of the museum, creating a visual dialog between ceiling and floor, between the tradition of frescoed ceilings and collage.’ In the words of the show’s curator Seher Tareen, it’s his masterpiece! Naiza Khan, who will be the first artist to represent the Pakistan at its first national pavilion at the Venice Biennale this year, is showing her iconic ‘Armour Suit for Rani of Jhansi II’, made out of galvanised steel, feathers and leather. ‘Rani of Jhansi’ is part of a series of armour works which began in late 2006, under the title BehishtiZewar/Heavenly Ornaments.